Calories per oz is 116.41. Lunch has always been a harder meal for me. I do not want to cook so I have always simply did Tuna wraps, or PB&J on a tortilla. This time will be different. 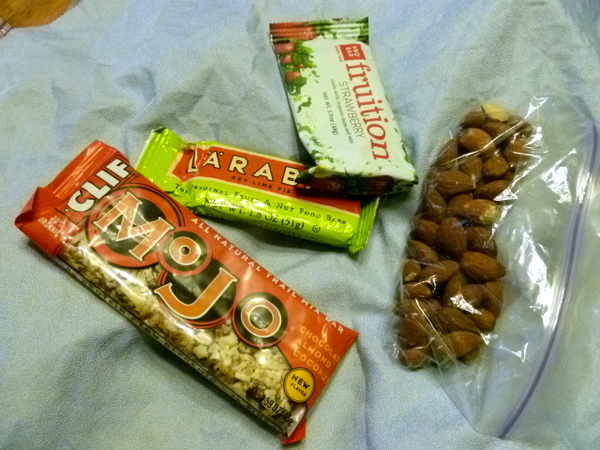 I want something quick, so I am going to be going with an energy bar of some sort and a protein shake. Quick and easy. I am bringing a number of snacks. 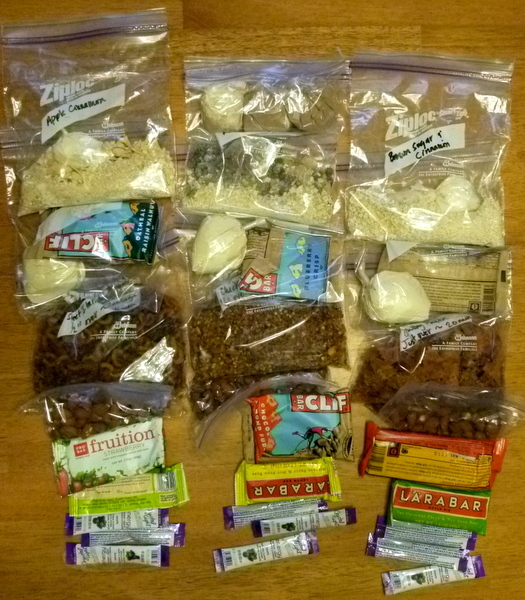 Larabars, Clif Bars, almonds, dehydrated apples, and a few other things. I will have a snack between breakfast & lunch, and then another between lunch & dinner. I am bringing extra snacks to make up for those extra hungry moments (although based on past experiences, I am expecting to bring some back). 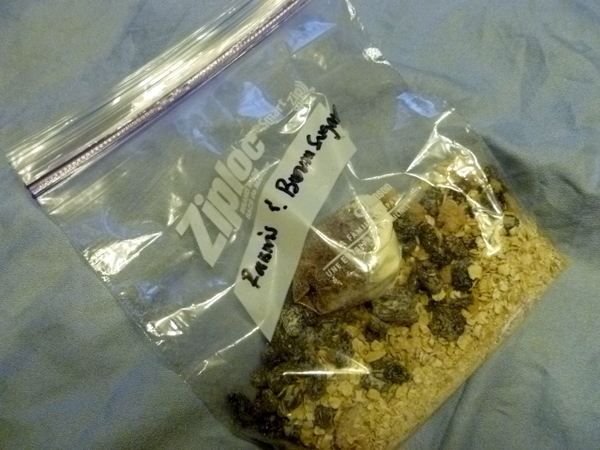 This entry was posted in DIY/MYOG, Food and tagged Appalachian Trail, Backpacking, Clif Bars, Dehydrated apples, DIY Instant Oatmeal, Food Planner, Hawk Vittles, Hiking, Larabars, Trail Cooking & The Outdoors. Bookmark the permalink. If you need extra protein at breakfast, add protein powder to the milk powder for your oatmeal. I use Quinoa flakes (6g protein per 42g) in place of oatmeal (3g protein per 35g). You can use any add-ins just like instant oatmeal: cinnamon & raisin, apple & brown sugar, etc. Also replace half the oatmeal in homemade granola with Quinoa flakes to add a little extra protein. Thanks for the tips True Blue. I will have to try the granola. I liked the oatmeal, but for more than about 5 days in a row it would get old I think. And you can be sure that I will get lots of pics and some video. You got some good HV choices. Cowboy Pasta yummy! The Sausage is AWESOME! Luckily you are FBC these with actual freezer bags. 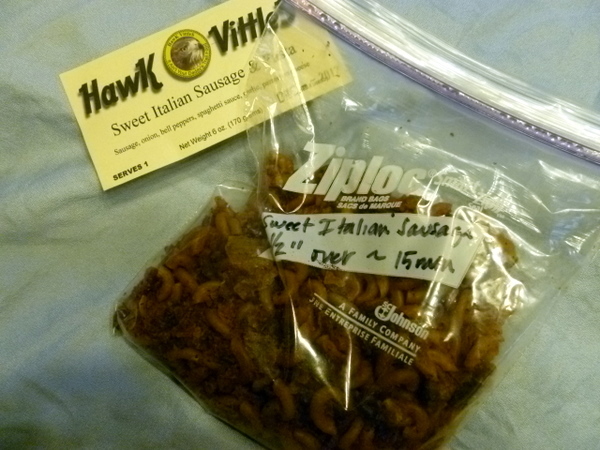 The Sausage has a high fat content and sticks to your pot after you cook. I use protein shakes on a daily basis when I’m trying to bulk up. They don’t fill me up at all and I’m hungry like an hour or two after I have the shake (and thats just doing accounting). I find protein bars higher in calories (500 cal) are more effective for me and keep me sustained while I’m hiking. You seem to be eating the same breakfasts each day. Try some variety in that area. Enertia Trail Food granola and milk was awesome! You could even make your own granola and milk with nuts and berries. Pop tarts… a staple at 400 cal per packet. Have fun on your trip. I look forward to your video. Also, how cold will it be? You may want to toss in some flat bread for your meal at night. You’ll need more calories to keep warm at night in the colder temps. Chad, I put the shake powder in a ziplock. When ready to drink, add the water, close mix up, then cut a small corner off and drink from the bag. Nothing to clean up. That is good. Now that you mention it I know I have heard it before, but thanks for reminding me. If the protein shakes turn out to be good while I am on the trail I will remember this for the next hike! Maybe I’m missing the obvious. How do you prepare the protein shake? In a water bottle? In a baggie? I will use my Gatorade bottle to make the shake. I don’t plan on filling it too the brim with shake though. According to the directions, the amount I have should be mixed with 6 – 8 oz of water. I will probably add about this much, then drink it and then add more water to the bottle to wash it out and then continue to use it as a water bottle. Thanks Green Giant. You know, I have always wanted to get some to try, but that is one of those things that I just never think about. One day I will remember it and get some! Thanks for the tip! Stick, you might give Enertia Trail Foods and PackIt Gourmet for some variety beyond the salt licks that Mountain House calls meals. 😉 Enertia is branded as Coleman as well. I’ve been told that some of the larger Wal-Marts carry them but I’ve never checked. 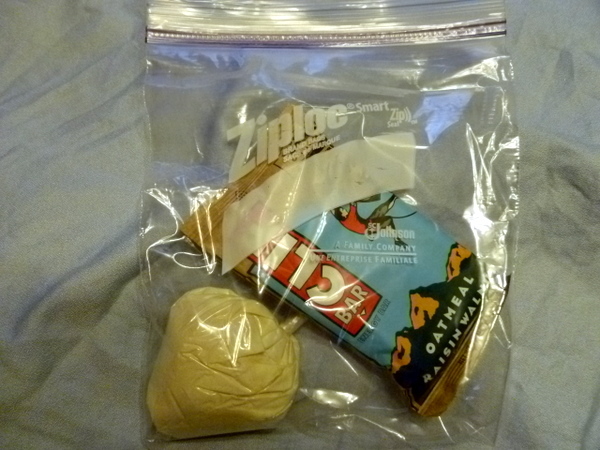 What are those pouches in your ziplocks that have the snack bars in them? PackIt Gourmet are some of the worst in the industry when it comes to calories. Taste good, sure. Worth their calorie-to-ounce value, nope. I only buy my spoilers from PG. I absolutely love their smoothies! You should be able to just snag a few extra zip ties from the fresh fruit and veggie section at your local grocery store. John may be right, but something I learned is even though I spend more energy on trail than at home I eat about half as much and I snack more than eat full meals as well. I have never felt hungry or weak, but everyone’s different. Also those protein shakes can pack quite a punch for next to no weight. What dehydrator are you using and where did you find it? Ok I’ll check that out. Also I just remembered zip ties tend to be by the garbage bags in Kroger, at least they were the last time I looked for any but yeah that tape looks like it’ll hold pretty well. Your totals look a bit on the light size for total daily calories. Sub 4k per day is pushing it for hikers, and you are a good thousand under that. Granted it will be a short hike and your body can feed off itself a bit, but you might start to feel it on day two with reduced energy. Others I am sure can chime in on this, but anything in the 2k per day range is really pushing the lower limits of what you should be consuming IMHO. The way I do my coffee is I take one serving of Optimum Nutrition Platinum Hydrowhey (Turbo Chocolate) and mix a starbucks via into it. This allows me to drink it hot or cold. It gives me both a very nice amount of protein (30 from the Whey alone) plus the caffeine from the coffee and the chocolate is always nice of course 😉 I do the same thing with repacking it into individual daily bags. I happen to take liquid sugar (stevia) so I just put it into a little micro dropper. Your breakfast meal seems a bit low on the calories for 4 ounces. It might be worth an extra half to quarter ounce to add some finely chopped cashew nuts. They are 156 calories per ounce and give 5.2 grams of protein per ounce. Get them finely chopped and you should not notice them in your oatmeal.